FERDINAND, Ind. (CNS) — When Pope Francis called for “a more incisive female presence” in the church in his 2013 apostolic exhortation, “The Joy of the Gospel,” women in the church took notice. And a handful of women in southern Indiana took action. They began organizing a conference focused on female leadership in the church and brought it to fruition Oct. 7 to 9. About 250 women and a handful of men gathered for the “Women of the Church” conference at Monastery Immaculate Conception Church in Ferdinand. The event was sponsored by the Benedictine Sisters of Ferdinand and St. Meinrad Seminary and School of Theology in St. Meinrad. 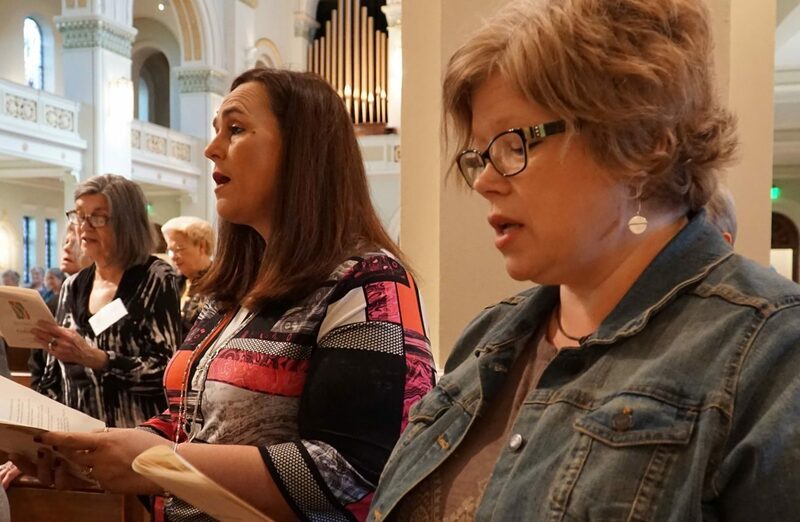 While participants were interested in fostering female leadership in the church, the focus of the weekend steered clear of female ordination. Instead, the conference buzzed with the notion that leadership in the church flows from baptism. Cummings, a historian at the University of Notre Dame, was one of three keynote speakers during the conference. She was joined by Carolyn Woo, the outgoing president and CEO of Catholic Relief Services, which is the international relief and development agency of the U.S. Conference of Catholic Bishops. The conference’s final keynote was presented by Sister Mary Catherine Hilkert, a Dominican Sister of Peace, who is a professor of theology at the University of Notre Dame. Woo, whose talk centered on her own journey as a female leader in the church, noted that she had trouble imagining herself as a church leader because she had few examples to follow. She drew strength and inspiration, she said, from the Maryknoll sisters who taught her in Hong Kong, where she was a refugee from China. Sister Hilkert repeated the emphasis on the baptismal call and encouraged her listeners also to draw strength from the gifts of the Holy Spirit. She noted that throughout Scripture, God entrusted his word to the entire church — men and women. For the church to be whole, she said, all people must be able to share their gifts. The cardinal-designate and Bishop Thompson answered a variety of questions related to the role of women in their dioceses and in the wider church. The questions were culled by conference organizers from about 40 queries submitted by conference participants. Both men acknowledged that there was room for improvement in their dioceses and in the church. Cardinal-designate Tobin encouraged his listeners to help church leaders recognize ways women can and do contribute to the church. “We don’t always see or hear what’s there. Point it out. Sometimes we’re not aware,” he said. He also encouraged women to enroll in programs like St. Meinrad’s lay degree program, where they can receive the training they need to earn leadership roles in the church, he said. McAllister is editor of The Record, newspaper of the Archdiocese of Louisville, Kentucky.